Okay let's brush those sbrisolona crumbs off the sides of our mouth and hop on a plane from Italy to Argentina, Uruguay, Peru, Ecuador, Paraguay, Brazil or Chile (whichever country you prefer, maybe somewhere warm). 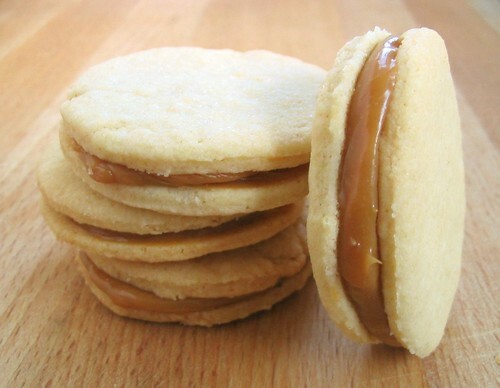 The delectable alfajor, a sandwich cookie made with buttery biscuits filled a layer of dulce de leche, is a very popular snack in all of these South American countries. The cookies can be dusted with some powdered sugar or covered with chocolate. I dunno about you but anything with dulce de leche has my full, undivided attention. And yes these are as delicious as they sound. Dulce de leche is very easy to make at home. You can either start with whole milk and use Pim's recipe or start with a can of sweetened condensed milk. I chose to with go the condensed milk route but I was scared to death of the whole "can may explode" warnings because hey if it can happen, it will probably happen to me. I envisioned a loud bang and hot goo covered can shrapnel flying every which way. So better play it safe. Luckily, I found an explosion-free way to make dulce de leche using a double boiler. Pour the can of condensed milk in the top part of the double boiler and simmer for a few hours, stirring occasionally until the DDL is the color and thickness you like. At the end of cooking mine was almost solid. Steven turned the pan upside down and marveled that it barely moved at all. Beat the butter and sugar until light and fluffy. In another bowl whisk together the flour (starting with 1 cup), cornstarch, baking powder, and salt and set aside. Add the egg and vanilla to the butter and beat until smooth. Add the dry ingredients and beat until the dough comes together. Add some of the remaining 1/4 C of flour if the dough is too wet. Roll out the dough to about 1/8 in thickness and cut into whatever shape you desire. Bake for 12 to 15 minutes or until the edges are light golden brown. Cool on a rack and fill with a teaspoon or more of dulce de leche (I chose more). Dust the tops with some powdered sugar (add a tiny bit of cinnamon if preferred). I skipped the dusting part. These are one of my favorites so I will be submitting these to Susan for her Eat Christmas Cookies Event. Head on over to her blog for even more Christmas Cookies! I tried to make these using dulce de leche from the baked can method, but it was too liquidy to hold the cookies together. I'll definitely try this double boiler method. Clabber Girl makes a very good pre-made dulce de leche. I've been using it for a couple of years. It's available at the grocery or I think it can be mail-ordered. That way, no explosions - and it has a good consistency. Happy holidays! Amy, I'm a total sucker for dulce de leche, too - thank heavens it's so easy to find it here, it's really popular. David Lebovitz has posted an interesting way of making dulce de leche in the oven - I have never tried it, but it certainly seems safe. Your alfajores are to die for! these sound dangerous:). I would probably eat 10 in one sitting! These look phenomenal! I've made Pim's dulce de leche before. It was wonderful, but it took 6 hours! I think I'll try your way this time. I have heard of these, but have never tried them. I love dulce de leche though, so I bet they are tasty!! I made Alfajores about a mounth ago.I love it!! These are one of my favorite cookies, hands down. Very pretty! I'm posting about how to make dulce de leche from scratch (not from canned condensed milk) later tomorrow...check it out! It's amazing how close it tastes to what I had in Argentina! Sweet sweet nectar of the gods! I love dulche de leche, I bet these are delicious. Now I don't have to wait for Marce to send me some...yippee! They look wonderful! Dulce de leche-- just seeing the name brings a smile to my face. Gorgeous cookies. I love alfajores! I always eat so much of them when I am in Argentina. My mom makes them sometimes and there soo good. Only she adds also some coconut on the sides. I makes it even better!!! really like your site, especially the 12 days of cookies! I'm from South America and I have been eating alfajores and dulce de leche all my life, I love them! This is a nice recipe. You should also try chocolate alfajores, and maizena alfajores with grated coconut (like these but rolling the dulce de leche edges over grated coconut, those are traditional to Uruguay and Argentina).